I have dreamt of owning a fringed jacket for as long as I can remember. In my mind it was a beautiful tan suede jacket with long fringing hanging off each arm and the back. I pictured wearing it with a bohemian white top with floral detailing, denim shorts and my Converse. In reality, I’ve not ever been able to find said jacket so gave up looking. And then I came across this one. You might have noticed that this jacket is neither suede nor tan but that no longer matters, because I want it. Badly. 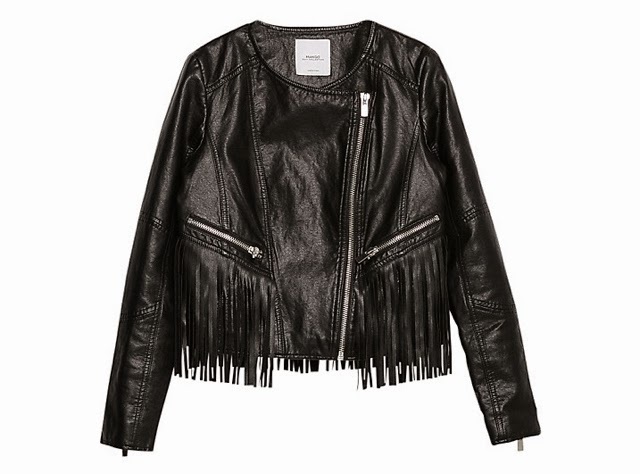 This Fringe Jacket from Mango is perfection. First up, let’s talk about the fringing and how it hangs from the pockets at the front all the way around the back. This makes me forget that I ever wanted fringing on the arms. The asymmetric zip fastening, the round neck, the cropped fit, all just perfect. If only I had known I was looking for a fringed biker jacket all along. Now to wait for pay day.